is at the forefront of the Construction Machinery Attachments industry for one reason: quality. if you have a need, we can and will fulfill it. No job is too big, most aren't too small. 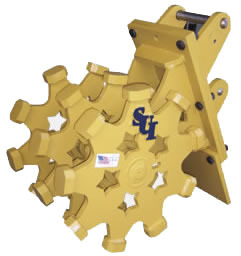 To order your next custom-fabricated attachment from us, simply call 1-800-761-7301 or email us at sales@stoufferequipco.net with your specifications, and we'll call you within 24 hours to confirm your order. 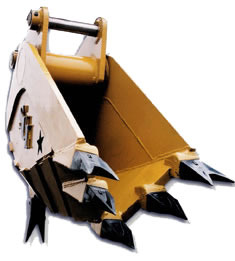 These buckets provide increased dump height to meet your dump height restrictions, they are especially popular for loading debri/green waste into tub grinders. Click HERE to see the Hi-tip in action. 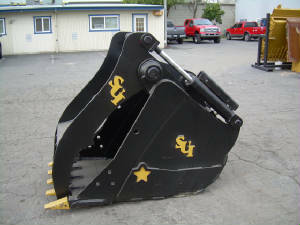 The Revolutionary "Demo Quick Clamp Bucket"
SUI has created one of the most revolutionary attachments in the industry. 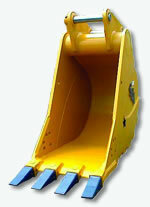 The Demo Quick Clamp Bucket has the thumb attached directly to the bucket. No more down time attaching or removing the thumb. With the Quick Clamp, the thumb is attached right to the bucket and works with your hydraulics system. Now, simply remove the bucket and the thumb goes with it!! Not only will it save you time, but it will speed production too! 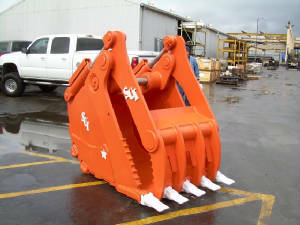 The DQC bucket can be sized to fit any machine with any coupler configuration! Both manual and hydraulic stick-operated, SUI THUMBS are available in a variety of sizes to facilitate your need. AR400 tines and highest-quality steel fabrication allow you the best product available at the best prices you'll ever experience. Call today! Fabricated with high-abrasion resistant AR400 material for machines ranging from 25,000 lbs. —180,000 lbs. For wheeled and track loaders or excavators. Fabricated with high-abrasion resistant AR400 material. Available in varied tine spacing. From 25,000 lbs. —180,000 lbs. machines. For wheeled and track loaders or excavators. Pin settings to match your plate or coupler. Made from abrasion resistant Steel, SUI Rippers are available in a wide array of sizes and configurations to meet the needs of the most demanding applications. For machines ranging from 2,000 - 200,000 lbs. Ships with extremely durable AR400 replaceable tooth. From mini-excavators to 190,000 lbs. machines. 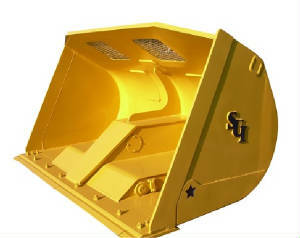 SUI Buckets are manufactured with AR400 and T1 material with heavy duty shanks and teeth. 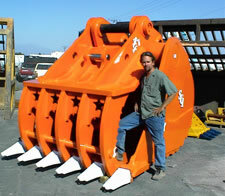 For wheeled or track excavators. Pin settings to match your plate or coupler. Made from abrasion resistant Steel, SUI Rippers are available in a wide array of sizes and configurations to meet the needs of the most demanding applications. For machines ranging from 2,000 - 200,000 lbs. Ships with extremely durable replaceable teeth. From mini-excavators to 190,000 lbs. machines. SUI THUMB/BUCKET COMBOS are manufactured with AR400 and T1 material with heavy duty shanks and teeth. 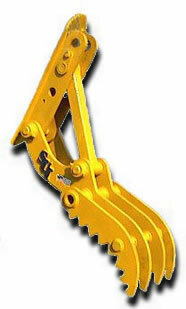 For wheeled or track excavators. Pin settings to match your plate or coupler. THUMB/BUCKET COMBOS are available in a variety of sizes to facilitate your need. AR400 tines and highest-quality steel fabrication allow you the best product available at the best prices you'll ever experience. Call today! For mini-excavators and skid steers to 190,000+ lbs. machines. Available in 12" width to 48" standard - to any width your job requires. Manufactured with double-row roller-bearings, AR400 compaction pads or sheep feet. Machined bearing races, ultra-protected Zerks and highest-quality steel make this unit the best available product on the planet. Contact us for your quote or more information.